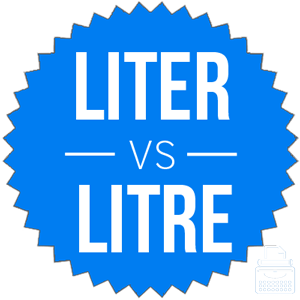 Home » Liter or Litre – What’s the Difference? If you are in the United States and want to buy a large volume of soda, should you ask for liters or litres? If you are making the request aloud, it won’t matter, since these words are pronounced the same way, and actually mean the same thing. The only difference is in their spelling and where in the world they are used. What is the Difference Between Liter and Litre? In this post, I will compare liter vs. litre. I will include example sentences that demonstrate each word in its proper context. Then, I’ll use a memory tool, called a mnemonic device, to make choosing either liter or litre much easier in real writing. What does liter mean? Liter is a noun. A liter is a unit of volume in the metric system, equivalent to 1.75 English pints. Within the broader metric system, a liter is equal to 1,000 cubic centimeters of water. Even in the United States, which officially endorse the English system, liters are an important unit of measurement. Soft drinks are often sold by the liter, and milliliters, or 1/1000th of a liter, are the standard unit for measuring dosages of liquid medicines. Marcy’s friends told her to also buy a two-liter bottle of Coca-Cola when she ordered pizza for the party. Edgar was dismayed when a question on his 10th grade physics test required him to convert liters to gallons, because he had not studied that worksheet. The official name for the metric system is the International System of Units. It is widely used in science and industry and has been adopted by most of the international community. What does litre mean? Litre is another spelling of the same word. Litre is actually the standard spelling within the International System of Units and most countries that speak English use it. Litre was originally a French unit of measurement, and the French borrowed the word litron from Latin, where it had been on loan from the Greeks. This spelling is more common throughout the world. Liter is predominant in American English, but since Americans don’t use the metric system, even they don’t use the word much. As you can see, American English writers are much more likely to use liter, where British English writers are much more likely to use litre. These words each refer to the same unit of measurement. The only difference is in their spelling and the language community where they are standard. Liter is used in the U.S.
Litre is predominant everywhere else. Since liter ends in -er, like the American city of Denver, it is easy to remember that liter is the American spelling. Is it litre or liter? Liter and litre are two ways to spell a metric unit of volume equivalent to about 1.75 English pints. Litre is standard in most of the world. Liter is standard only in American English. Other than this regional consideration, these two words are interchangeable. 1 What is the Difference Between Liter and Litre? Lynchpin or Linchpin – What’s the Difference? Skeleton vs. Luge – What’s the Difference?